Q: What do you call a Roman with a cold? If you have fear of flying, people will tell you to 1) get drunk before flying 2) take prescription anti-anxiety medications. Well, I don’t drink because alcohol makes me sick, and I have tried the usual anti-anxiety pills. They did nothing to help, so I doubled the dose. After that I was still intensely frightened, but also too stupid to negotiate airport layovers and transportation post-flight. Now all I take is an Ambien at “airplane bed time” so I can pretend to sleep for an hour or two. Q: Why do French people eat snails? A: They don’t like fast food! And then there were the fear of flying hypnosis cds which I listened to for two weeks every night before traveling. The first, narrated by a grammar-challenged British man, urged me to be “deeply relaxed, more than you have been for a long time. Go deeper and deeper, and deeper still”. (I never once felt deeply relaxed, but I did consistently giggle at the sexual innuendo.) And on it went, having me visualize “uploading my luggage to the luggage trolly” (uh, I carry-on only) and then on the plane I was to notice that the flights attendants “don’t have care in the world” (total b.s: flight attendants are the hardest working people in the world) and finally I repeated “When I travel by plane I feel safe and secure” ad nauseum. With no result other than chronic irritation, I moved on to a second fear of flying cd. Imagine the most annoying new age catch phrases you’ve ever heard, recited by a lady Yanni all blended up with a synthesizer backdrop, and you’ve got an idea of how worthless and tiresome this hypnosis program was. So I took the intellectual approach: reading books and articles about airplanes, the engineering of flying, and lots of statistics. This was somewhat helpful. A phobia is not logical by nature, but it has been comforting for me to understand what causes turbulence, and to know what all those sounds are that the airplane and it’s engine makes. Q: What do you call a Spanish streaker? While in flight I watch every crappy movie, eat all the questionable airline food, and closely study the Skymall magazine with HOB while trying to decide which decor item we could buy that would most horrify my parents. Distraction can be effective, though during takeoff and landing I am in a panic state and distraction won’t work. HOB will help me by taking notes like: “Engines started 9:20 pm. Take off started 9:25 pm. Wheels up 9:26 pm. Clouds 9:28 pm”. 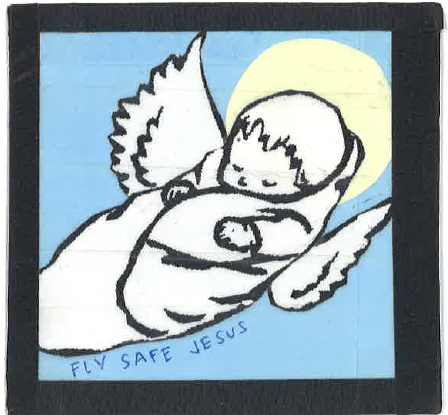 My artist friend Kristen made me a series of Fly Safe Jesus™ talisman, which I hold in my hand during take off and landing. Fly Safe Jesus™ must be protecting me because no plane has ever crashed while I was holding one. Q: What do you call a pissed off German? Truth: the most effective coping mechanism for my fear of flying is punning. I discovered this accidentally while, when boarding a plane, I spontaneously belted out a “man walks into a bar” joke to HOB and continued with every joke in this genre I knew until the plane was in the air. I was still scared, but not in danger of peeing my pants. From that point forward, I keep lists of puns and short jokes to memorize pre-flight, and tell them during the most terrifying moments. I save my favorite pun for the scariest part, so once I’ve told it I know the worst is over. Q: Did you hear about the Italian pastry chef that died? A: I cannoli guess what his family must be going through. If you’re lucky enough not to be afraid of flying but know someone who is, for the love of God do not tell that person horror stories. It’s hard to believe how many people will, on hearing I hate to fly, immediately tell me the worst thing that’s ever happened in flight to them/their cousin/their best friend’s neighbor’s uncle’s dogwalker. NO SCARY STORIES PEOPLE! And for extra credit, realize that someone like me who has an intense phobia and confronts it by repeatedly doing the thing that terrifies them, is brave as all get out. We deserve your praise, your respect, and if you want to share, your best puns. Before every trip, I stop at the thrift store for 25¢ novels to read while traveling, the more cheesy and escapist the better. I’m not lying when I tell you these books all invariably turn out to have a plane crash as a plot device. On my last trip, there was a plane crash mentioned on the very first page. 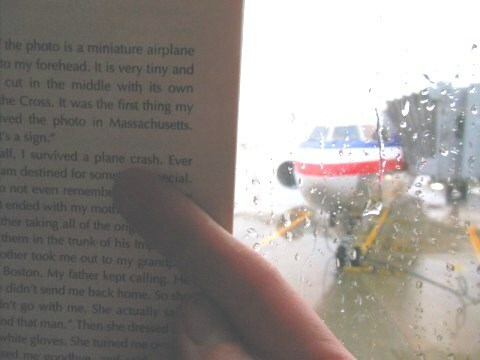 As evidence, here I am holding my novel and pointing at the plane craft reference, with my upcoming ride across the Atlantic seen out the window. I think it’s hilarious that you’re scared of flying. that being said, I am as well. I’m scared and I get motion sickness. but until they come up with a way for me to teleport then I’ll be flying. one of my really good friends makes her husband drive everywhere when they travel in the states because she’s so scared of flying. I love the fact that it’s puns that get you through it. lol. 🙂 also fly safe Jesus seems to be working super well. I eat ginger chew candies for motion sickness–maybe that could help you too? Anyway, they’re tasty so you could be scared and sick eating yummy candy. What fun to read your blog. “happy traveling”.